P G Jayasingha sat on his bed with a bloated stomach. Both his kidneys had failed and he was unable to pass urine. He could not drink water despite being thirsty. His arms and legs would constantly ache and his eyesight had failed him. That was in February when Down To Earth visited him. The 34-year-old resident of Sri Lanka’s North Central province succumbed to his illness in May. A couple of years ago Jayasingha had lost his father to renal failure and lived with his mother, also a kidney patient. His wife and daughter had left him after he was diagnosed with the disease in 2009. It was in the late stages and doctors put him on dialysis. Every week Jayasingha would make the arduous journey to the district hospital at Polonnaruwa, some 40 km from his village, Mailagashandiya. His condition needed dialysis once in three days. But due to want of adequate machines to cope with the increasing cases of kidney patients in the district, doctors would accommodate him once a week. Besides, the treatment is expensive. Each round of dialysis cost him 5,000 Sri Lankan rupees (LKR). Unable to work, the erstwhile carpenter had to rely on individual donations for his treatment and that of his mother. Jayasingha was a teetotaller. He did not suffer from hypertension or diabetes, which commonly trigger renal failure. With no known cause, doctors termed his disease, Chronic Kidney Disease of Unknown Etiology, or CKDue. In patients suffering from CKDue, the kidneys shrink to almost half the normal size, or even less. At this size, the kidneys are damaged beyond repair; death is near certain. Jayasingha was among the nearly 15,000 patients being treated for CKDue across the north-central region of Sri Lanka. Most of them are male agricultural workers, in the age group of 30-60 years. First identified in North Central province some two decades ago, CKDue has since emerged as a major health and environmental crisis in the dry zone of the country. 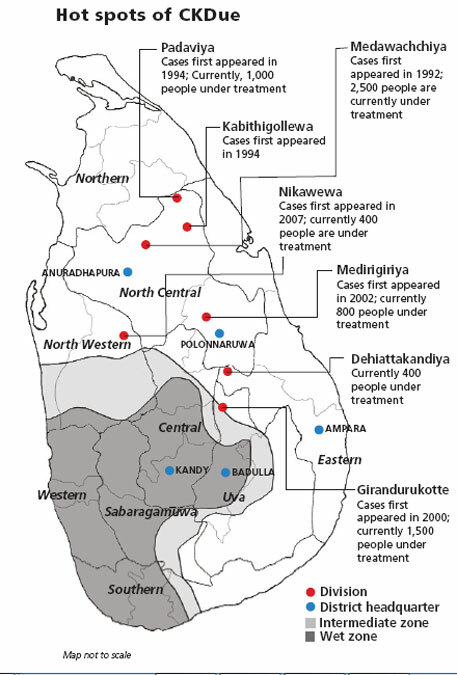 Polonnaruwa and Anuradhapura districts are the ground zero for the disease. Over the years, the disease has become endemic in parts of Eastern, Uva and North Western, Central and Northern provinces, adjoining the North Central province. The affected area covers approximately 17,000 square kilometre with a population of about 2.5 million; 95 per cent of them live in rural areas. Medirigiriya, Medawachchiya Kabithigollawa, Padaviya, Nikawewa, Girandurukotte and Dehiattakandiya are the worst affected districts/divisions (see map). “I was posted at Anuradhapura district hospital in the 1980s,” says Tilak Abbeysekhara, consultant nephrologist at the General Hospital in Kandy, the capital city of Central province. “Then, we mostly received cases of renal failures due to snake bites. It was only after I moved to the Kandy hospital in the 1990s that I came across cases of CKDue. Almost all CKDue patients were from North Central province.” Since the 1990s, Abbeysekhara has been working on unravelling the mystery of CKDue. According to a study by Rohan Chandrajith of University of Peradeniya, there was a 227 per cent increase in the number of patients who are discharged with end-stage CKDue between 1992 and 2006 at Anuradhapura General Hospital, the apex hospital in North Central province. During the period, the death from CKDue had increased by 354 per cent. Each district in North Central province has a hospital. But they do not have adequate facilities to handle the large number of patients requiring dialysis, says Hemantha Withanage of Centre for Environmental Justice (CEJ), a non-profit in Sri Lanka. Sometimes, even the available dialysis machines lie defunct. Patients have to travel more than 100 km to Kandy or further away to Colombo for treatment, he adds. Lack of facilities means patients are usually diagnosed at advanced stage. The fact that the country’s health minister, Maithripala Sirisena, hails from Polonnaruwa has not helped. A few years ago, with the initiative of Abbeysekhara and others at the Kandy General Hospital, renal satellite centres and mobile clinics were set up in 10 divisions across the north-central region. Health workers at these centres use diagnostic strips to detect a rise in the protein levels in urine. “This is an indication of the first stage of kidney problem. CKDue can be arrested if identified in the initial stages,” says Abbeysekhara. In Gration Rodrigo’s village, Hingurukgoda in Polonnaruwa, about 600 people were tested at the renal satellite centre in 2011. Of the 26 people diagnosed with renal failure, six were in advanced stage and had to be rushed to Kandy General Hospital for dialysis. In about 160 people, including Rodrigo, the protein level was below normal. Their condition improved with treatment. But Rodrigo’s illness was not just restricted to renal ailment. Recently, he underwent angioplasty. Patients with renal diseases usually end up with heart diseases at a later stage. “The health ministry and doctors need to work together and set up more renal satellite centres so that patients are identified at the initial stage. 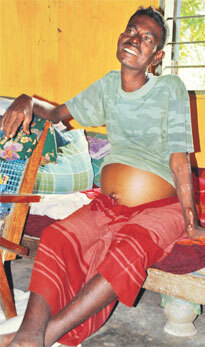 But there is lack of coordination among them,” says Nalin Ranasinghe, district medical officer of Polonnaruwa. 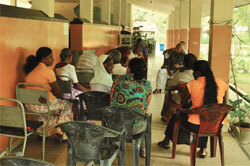 The renal satellite centre at Hingurukgoda treats about 300 patients at present. So far, a dozen studies have been conducted by national and international scientists to identify the cause of CKDue. They suggest a range of reasons: intake of arsenic and cadmium through food and water with agrochemicals as the major source; presence of fluoride in groundwater and fluoride reacting with aluminum utensils; hard water; toxins produced by cyanobacteria or blue-green algae; bioaccumulation of chemicals in reservoirs; illicit liquor; and ayurvedic medicines. Though it was understood that the disease was spreading through water, no one has been able to pin down the reason. In 2011, Sri Lanka’s Ministry of Water Supply and Drainage and non-profit CEJ approached the Centre for Science and Environment (CSE), a Delhi-based research and advocacy body, and sought its assistance in testing water quality. CSE’s Pollution Monitoring Laboratory collected 40 water samples—35 from Ampara, Badulla, Anuradhapura and Polonnaruwa districts that have reported high incidence of CKDue, and five from Kandy that so far remains immune from the disease. CSE researchers collected water samples from tube wells, dug wells, municipal supply, tanks, rivers and springs, and analysed their physico-chemical parameters—total dissolved solids (TDS), hardness, calcium content, and heavy metals and fluoride. WHO has been researching the causes of CKDue for the past few years in Sri Lanka. It has so far not issued any public report on its findings. However, two days before CSE was to release its study in Sri Lanka, few researchers released a document to the media titled, World Health Organization report on Chronic Kidney Disease of unknown etiology (CKDue) in Sri Lanka- a summary. The report states that CKDue patients excrete high levels of arsenic and/or cadmium in the urine. They also have high levels of arsenic in hair and nail. However, in the same breath the report concedes that it has not found any arsenic or cadmium in drinking water. The report is also silent on arsenic and cadmium levels in food commodities. The report goes on to blame imported fertilisers laced with arsenic and cadmium as well as pesticides as the cause of CKDue. “But how is arsenic and cadmium from fertiliser getting into human body if not through water and food?” asks O A Illeperuma, a widely respected senior scientist working on CKDue in University of Peradeniya. Many in Sri Lanka are now asking WHO for an explanation. Since the most dominant scientific views, including that of the World Health Organization, had linked arsenic present in agrochemicals with CKDue, samples of soil, rice grains and plants, pesticides and fertilisers were also tested for arsenic content (see ‘WHO’s conundrum’ on p40). CSE’s analysis ruled out presence of arsenic in rice and plants. It was, however, found in soil, pesticides and fertilisers at very low levels. The study also ruled out the presence of heavy metals in the water samples examined. The rest of the physico-chemical parameters were, however, higher in groundwater samples than that of tanks, municipal supply, springs and rivers. Survey showed people in the affected districts consume water directly from dug wells and tube wells. The CSE study also reveals that most of the groundwater samples in the affected areas contained fluoride beyond the desirable limit, prescribed in Sri Lanka’s standards for potable water. Fluoride levels in affected areas were in the range of 0.4 to 1.7 ppm as compared to 0.3 to 0.9 ppm in the unaffected areas. Studies have proved that ingestion of fluoride at low levels over a long period of time is a possible risk factor for kidney diseases. Water samples from the affected areas also contained high levels of TDS, hardness and calcium content (see ‘Findings of CSE’ on p39). People in the affected areas are drinking relatively poor quality water than those in the unaffected areas, CSE’s study concludes. “Despite the many theories, heavy metals like arsenic, cadmium, lead and chromium in drinking water is not related to CKDue in Sri Lanka. If heavy metal is responsible, then there is a different source for it other than drinking water and that should be explored,” says Chandra Bhushan, deputy director general of CSE. Though unaware of the scientific fndings, people in the affected areas also feel there is something wrong with the groundwater. Jayasingha, in his last year, had started boiling water before drinking. The lone open well in his village was his source of water. Unlike urban areas, there is no piped water supply in villages. Those who are rich go for bottled water, which, of course, does not come cheap. Others rely on water filter. But not many in these hinterlands can afford a water filter, which costs upwards of LKR 4,500, and are forced to rely on groundwater. The situation was not so till the 1980s, Chandrajith points out. Earlier, people used to depend on surface water or shallow wells. The 1980s was the UNÃ”Ã‡ÃªWater Decade. Many deep and shallow wells were dug to supply drinking water to people. Dependence on groundwater increased and the disease with unknown etiology began to surface, he adds. Sripura Padaviya village in Anuradhapura has found a way out of the situation. It has managed to identify a source of clean water. Out of 16,500 residents in the village, 2,500 are suffering from chronic renal failure. They used to rely on wells. Now, they travel up to 30 kilometres daily to bring spring water from Sinhaya Ulpatha, literally meaning lion’s spring, and Gonamariya spout. Water is brought in barrels and distributed among households. The army, too, relies on the water sources. The water supply board says all parameters of the water are well within the desirable levels. A Somavati’s village, Herathalmilawa, is the closest to Sinhaya Ulpatha. “We collect water from the spout and use it after filtering the dust with a cloth. There are 120 families in this village; only one has kidney problem,” she says. “The government is not yet serious about the disease,” alleges Withanage of CEJ. It must set aside a dedicated budget for tackling CKDue, and should provide funds to look after dependants of the kidney patients, he adds. CSE, which released its findings on August 16 at Anuradhapura, also recommends that efforts should be made to supply clean drinking water to villages so that their dependence of unfiltered groundwater is eliminated. There is also a need to upgrade medical facilities, increase the number of dialysis units and mobile clinics, notes the report. “Government of Sri Lanka should support further research on CKDue and its linkages with environmental and life style patterns. But scientific uncertainty should not be used as a pretext for not taking action like supplying clean drinking water,” Bhushan said at the meeting. Speaking on the occasion, Dinesh Gunawardene, Sri Lanka’s minister of water supply, said providing clean drinking water is the priority of the government and President Mahinda Rajapaksa is taking a special interest in it. Though, he added, research should continue to nail the reasons for the high prevalence of the disease in the region. I appreciate the effort of capturing epidemilogical aspects of CKD; however comprehensive approach needed to assess other associated factors, geneology,kinship and marriages,food culture, over the counter sale of NSAID, perception of pain and relief among people, toxicity in agricultural produces, consumering spending and quality of food available and accesable,geographical features assessing minaral composition of soil, industrial waste management, and finally radition level or possibality of dumping nuclear waste. I hope multilevel reserach is essential covering both qualitative and quantative aspects having on board social scientists, biologists, epidemiologists, toxicologists , policy specialist and other experts. I wish CSE or someone would take intrest for social cause.